10 Days Till 6 Months! Oh how I wish I had the time to write something here every single day! Mazen is changing so rapidly that I can barely keep up with him. There are two teeth that are definitely working their way up! His hair is growing in thicker by the day and our little chunk is over 20 pounds – and made of marshmallows he is so sweet! Lately he has mastered rolling over and is working very hard on sitting up by himself. He can do it, but he falls over unexpectedly so I don’t leave him unattended. 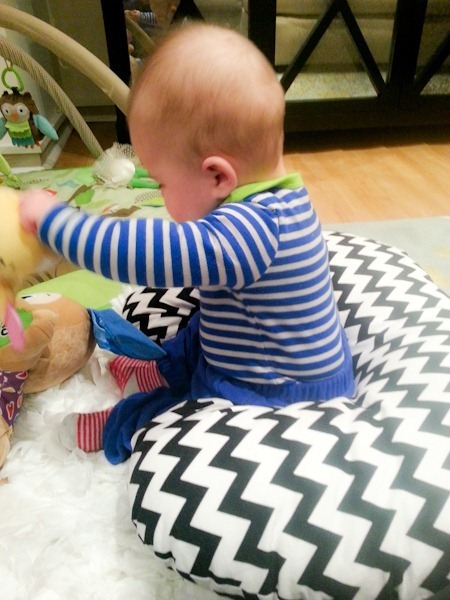 The Boppy has been so helpful for this too! I’m so excited for him to be able to sit on a blanket and play. He is over most of his seats and is still not into the GoPod. He doesn’t mind being on his back on his playmat, but I think he would be happier upright. He is happiest when we’re holding him and interacting with him in our arms. He’s getting so big and strong that we’ve started to be able to roughhouse a little. Of course I’m very gentle, but we can roll on the floor together and he laughs and laughs. The laughing is the best! He still loves reading and can turn the pages of his board books. I’m so impressed with that skill! He also has mastered holding toys, banging his hands on things, splashing in the bath tub, spitting, the letter B and laughing. Dislikes: Getting bored, having his face wiped, nightime sleep. He actually tolerates tummy time now, so I can actually imagine him learning to crawl in the future. I think we’re still very far off, but I’ve put ‘babyproof the house’ on my to-do list. I’d love some recommendations for equipment you guys love! He is actually a pretty good napper. We do 2 hour wake times and then he sleeps in his crib (unless we’re out on a walk) for naps and goes down pretty easily with just a few cries and paci adjustments. Naps are anywhere from 30 minutes to 2 hours (although anything over an hour is rare). 30-40 minutes is most common. We have started to drop a few night feedings. He used to nurse about every 3 hours at night because he would wake up crying and drink a full feeding, so we figured he was hungry. I began to experiment with not feeding him every time and much to my surprise he dropped two feedings very easily. I’m now doing a dream feed around 10/11 and then he doesn’t nurse again until 5/6. This means I have gotten to sleep 6-7 hours a few times [incredible!] but of course Matt has done all the parenting those nights, so Mazen has yet to sleep those hours himself. We’re going to sleep train any day now. Ferber comforting intervals. I’m just mentally preparing before all systems are go. I’m not looking forward to it. We have a very pacifier-addicted baby, and I think that might be why he can’t go back to sleep when he wakes. He seems SO close to self-soothing. He doesn’t really seem to need nursing or us – just his paci. Hopefully it’s an easy habit to break. I would do it all over again though because the paci has been a lifesaver for us with the small exception of broken night sleep. And guess what other first threshold we have passed through…..!!! The picture of him “eating” the laundry is mega cute!! Yay! I love posts like this because Mazen is only a few weeks older than my Lucy- I get to see what new things are just around the corner! I would have never thought you would be one to Ferberize a baby especially since you have done so much to give him a good start in life. There are many studies that indicate the Ferber method cause long term attachment issues and lack of trust in a child. Can you explain more why you think this is a good thing? Kath can answer for herself, of course, but I just wanted to point out that a recently-published long-term study actually showed that various sorts of sleep training had no effect on children’s long-term emotional health and well-being in general. J, I’m sorry, but what you say simply isn’t true. Studies do not “indicate” that babies sleep-trained through the Ferber Method, when done the way Ferber actually recommends through a loving regular nighttime routine and regular intervals of checking in, grow up into kids with attachment and trust issues. There are hypotheses about negative long term consequences of using the Ferber Method, but no conclusive evidence. Different sleep training methods work for different families. I tried CIO with my daughter at 6 months and was ready to give up in a heartbeat if it seemed like it was causing more harm than good. In her case it worked like a charm; incidentally she’s an independent, happy kid who loves and trusts her parents. Judge silently all you like if you don’t believe in letting kids cry it out, but throwing out false information and then setting up a strawman by asking Kath if she thinks raising her son to have trust issues is a “good thing” is just wrong. I am making an assumption that you’ve never read Ferber’s book based on what you are saying. When many people CIO, they are literally shutting the door on a baby and allowing them to cry themselves to sleep. What Ferber ACTUALLY says is to comfort them in decreasing intervals, starting at 2 minutes. Having said that, despite a thorough reading of Ferber, his method didn’t work for us. We started about a month too late, after baby was already standing, and he tried to launch himself out of the crib. We gave up after 3 nights of no sleep and hysterical crying on my part. Good luck to you Kath! This is where we are right now. It is not fun! What did you end up doing to get your baby sleeping? Right now we rock our daughter to sleep. It is getting old, though, because she needs this every time she wakes up. And I too had hysterical crying, watching my daughter screaming and trying to pull herself out of her crib. I just started sleep training after 5 months of holding my little one for every nap since birth. She just wouldn’t let me put her down. We’re on day 2 and she is already going to sleep in under 2 minutes of fussing. I feel like I got my life back, and can be more attentive to her when she is awake instead of rushing to get everything done before the next nap time. Not too mention i work from home could barely get my work done with a sleeping baby on my lap. I would never do anything I thought would hurt my daughter. I am right there with her and rubbing her belly at intervals. The longest it ever took was 14 minutes. She’s gone longer than that in my arms. I may not agree with everything kath does but in this instance I am right behind her. Wow, can you say judgmental? Who are you to tell her she’s going to damage her son? Keep your opinions to yourself unless they’re positive or helpful. She doesn’t have to explain to you, and I’m glad she hasn’t. I think it’s funny when people say stuff like this- ask your 16 year old who wants to sleep all day about his “attachment issues”. When you are far removed from these days, you will see how ridiculous it is to spend even an iota of time stressing about using the Ferber method or not. Each kid is different, and I would trust a parent who is with her child all day long (not in daycare) to know what is best for that child. I can see from the pics that the baby is incredibly bonded to his parents- helping him to learn to sleep through the night is NOT going to cause long term problems. It’s sort of cruel to come here and say that to a first time parent, J.
I will ask my 20 year old daughter if she trusts me now because I let her cry it out for one-two nights 20 years ago. Snort. See how ridiculous that is, J? I completely agree with your comment except for the implication that a parent who puts their child in daycare somehow wouldn’t know what is best for that child. If you want to talk about being cruel, there you go. Give me a break. There’s many studies on EACH side of EACH issue. There’s no one right way to parent. Wow, it’s crazy to see him so big! I remember reading when you just gave birth and he was just a little nugget. Chunky babies are the best in my opinion 🙂 If it was me, I’d be super impressed and proud of myself that I was the reason he’s as happy, healthy and FULL as he is 🙂 Unfortunately not many mothers are able to succeed as you were able with breastfeeding. What a great accomplishment for you and your body! I tried sleep training my daughter last month when she was right around 6 months old, and it went MUCH better than expected. She was pacifier addicted and used to being soothed at the breast every 2-3 hours at night. We Ferberized her (sorry, Meet the Fockers has me stuck on that term! ), and I planned to go in after 5, 10, then 15 minutes for protest crying, and abort the mission if it descended into hysterics. It was very anticlimactic – I prepared myself for an hour of drama at bedtime, and she put herself to sleep sans paci within 5 minutes. She then cried between 9-9:30, 12-12:30, and I fed her when she cried at 3:30 – just protest crying, nothing crazy. The next night she slept from 6:30 – 1:30 without waking, and the night after that from 6:30 – 3:30! We’ve had several setbacks since then due to a series of colds and teeth coming in. It was really hard to psyche myself up to sleep train, and also pretty hard listening to her cry, but I knew it was the right thing for everyone. She just needed the time and space to figure this sleep thing out for herself. Anyway! I know there’s a lot of mixed feelings and strong opinions out there about sleep training, so I just wanted to provide some encouragement. 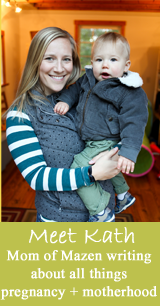 I’m SO glad you’ve kept up this website – I love reading about your experience with motherhood and seeing Mazen’s adorable face!! Stroller running looks incredibly hard! Be interested to hear how you find it! He’s definitely one of those babies you just want to pick up and squash…no matter what people say they’re not all like that but Mazen is so cute and cuddly! awww he is so adorable!!! He’s such an adorable chunk! Anderson was on track to be a chunker too, but he started crawling at six months and totally leaned out! He was always 80-90 percentile for weight and at our nine month appt was down to 55%! Just a question, and I’m not trying to start a mommy-war, but if you aren’t looking forward to sleep training, why are you doing it? Hi Kath! I wanted to say, whoa super cute baby, and give you some support for the sleep training ahead. I am in the midst of it with our 5 month old, and I have to say while it is SO SO hard it pays off. Ours was addicted to the passy (same thing, super super helpful for the first months, but it was getting to be too much with all the sticking the passy in 5+ times a night) and also swaddled. We cut out both at once with the sleep training, and also did Ferber, but read Healthy Sleep Habits, Happy Child to really bolster myself for the crying, and help me not feel so bad about it (you probably read it already, but it basically outlines there are no long term side effects of having your child cry, in fact learning to fall asleep/self soothe is way way more important than a few sessions of crying). As for the swaddle, if Mazen is chilly at night, I found the zipadeezip to really help ours keep warm and have some semblance of a swaddle coziness without the dangers of rolling over and not being able to move. Plus it is the most adorable thing ever, like a little starfish baby 🙂 I hope these tips might help you, Best of luck, YOU CAN DO IT!!!! 🙂 ps, start training with Matt there for the first few days!! Ferber will change your life. Don’t wait another day! Our son woke up all the time needing help to go back to sleep (and not to eat). Within two days we went from constant night wakings to 11 hours of sleep, with little crying. We trained at 4 months/13 lbs with pediatrician ok and we opted to eliminate all night feedings at that point. Good luck with it! Our son took to it very well – I hope yours does too. Good luck with the sleep training. We did Ferber’s suggested intervals in his Solve Your Child’s Sleep Problems book and it worked well. Yes – you got to mentally prepare for some crying and also I suggest being consistent for both naps and night sleep. If your going to Ferber for one you must also Ferber for the other, or its kinda pointless. I was homebound for a week in order to make sure all naps were in the crib and so she could self soothe (instead of falling asleep in stroller/car etc). Good luck with Ferberizing! Both of my kids were paci addicts too cured by Ferberizing (though one was easier than the other). No “long term attachment issues” or “lack of trust” at our house. Go for the sleep training! It won’t be as bad as you think and the results are worth it. I see you’re already getting attacked for it, but I think it works. You know your baby better than anyone so if you think it can help, give it a shot and you can always amend your plan as needed. My pediatrician puts it like this- if your child was continually trying to put his fingers in an outlet you’d stop him. He’d protest and cry at first but eventually learn not to go near it. Sleep training is the same thing and he probably will cry at first- you are teaching them that relying on mommy and daddy (or a paci) to sleep is not good for you since you can only sleep when they are with you. Eventually (and realistically within a couple of days) he will learn how to do it on his own. Its tough to hear them cry but with Matt’s support you can do it! Just do something distracting while it’s happening and if it gets more and more intense go in for reassurance. Good luck- keep us posted. I love that last picture and how he’s looking at you so adoringly. Now that’s he’s getting bigger, have you thought about doing any classes with Mazen? I used to work at My Gym, and not only is it super fun, but it’s really great to see what your child is truly capable of doing. I will say that it usually takes new moms some time to get comfortable with some of the skills, but once you let go, it’s really amazing. I hope to do something like that once he’s a little more mobile! I started swimming lessons with my daughter at 6 months, too, and that has been really fun! Even though it seems like you’re doing most of the work (they are parent and child classes) it always wore her out and led to a good nap! I am an infant nanny and I’m so sorry people have been attacking you on here for your impending sleep training choice. There is nothing wrong with sleep training and you know what’s best for your little boy. I have been with many infants from 2 Months up, it has been my personal experience that sleep training gives children the security and trust they need to be independent. The first week is always a bit hard because it’s a change in routine, but it’s smooth sailing after that and the babies grow accustomed to knowing that Mommy (or nanny in my case) is always close by and they are safe in their crib, and they learn to quickly drop off to dreamland knowing you will be there when they wake. Just my two cents. All the children I have been a nanny for have been sleep trained and they are now happy and secure 1, 3 and 5 year old children! 🙂 I think Mazen is flourishing wonderfully, so you keep doing what you’re doing, you are obviously a very good mother! For what it’s worth, my mom used Ferber with my brother and me 25+ years ago, and swore by it up and down. We’re a very tight-knit and loving family and both of us kids have grown up to have great careers, settle down in good marriages, and be very adventurous and independent, but still have amazing relationships with our parents. I know that that’s just one personal experience, but my mom still says it was the best parenting decision she ever made, because it gave her an opportunity to rest and therefore be a happier, more energized mom during the day. Not that you need encouragement – you seem to have a grasp on what Mazen needs and what you need as a mom, but just a little personal anecdote about one family’s encounters with the Ferber method. I can’t believe he’s 20 lbs! wooo! so chubby and cute! I also have a pack addict, so I really want to know how the sleep training goes. I’m so not looking forward to do that. oen question: what are the books that you recommend for 5-6 months baby? I want to start with night reading routine but wonder what are the options for such small babies. and he’s eating solid? purée or baby led weaning? so looking forward to read that! I read everything from simple number books to Frog + Toad. I just make sure there are pictures. ERIC CARLE. The very hungry caterpillar, brown bear, brown bear, panda bear, panda bear, does a kanagroo have a mother, too. Bright picture books, and anything with texture for the baby to feel is great! (Like Pat the Bunny). Engaging a baby in story time is super important! Quite possibly the cutest baby i’ve ever seen! Love the pictures, keep em coming! He is ridiculously cute, by the way. 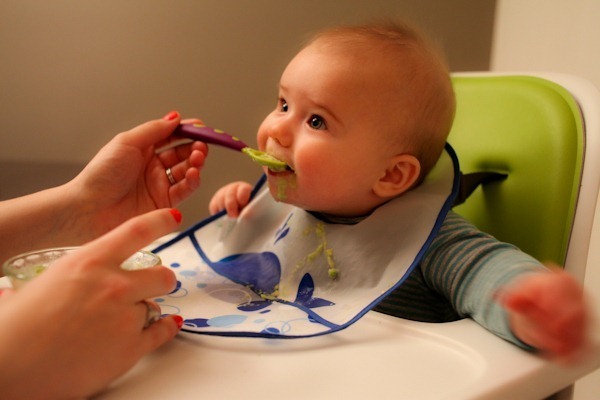 You will have so much fun feeding him solids. I can’t wait for your baby food post! We started solids on Saturday. Our ped recommends a lot of food right away (seemed like a lot to me), cereal, veg, and fruit all on day one (little amounts of course). So far we have tried oatmeal (not a big fan), sweet potatoes, pears, and prunes. She loves all the veggies and fruits. I’ve also made peas, butternut squash, and apples and froze them for later. I had so much fun making it and they are all such fun colors! Mazen is getting so big and he is absolutely adorable. We also had to so some sleep training the past 2 weeks. We let her cry during her 2am wake up. She was waking up at 2am EVERY night on the dot. We could set our clocks by it and she definitely wasn’t hungry so one night we let her go. She cried for 11 minutes and fell asleep. Now she just fusses a little at that time but it has made our nights so much better. Last night she fussed twice but before we could get out of bed to put the paci back in she was back asleep. Thanks so much for your post! 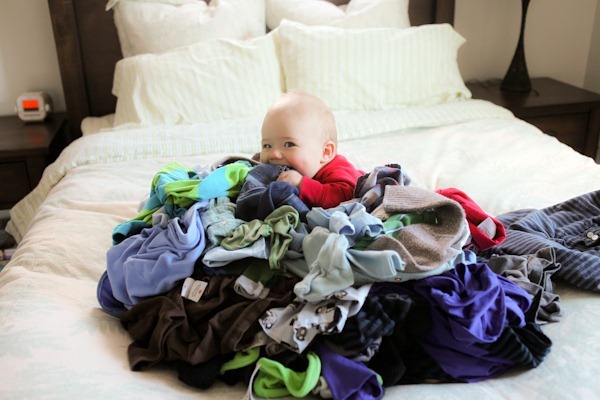 Love the laundry picture! 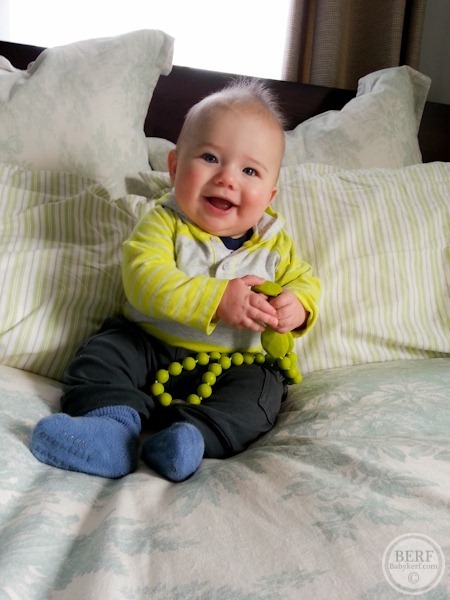 I’m surprised you say the paci has been a lifesaver when it is also causing so many night wake-ups for you!! I could not function with the night schedule you have described. Props to you!!! We use a paci with our 12 week old and sometimes need to replace at naptime but never during the night. Would you say M’s dependence grew over time or was there from the start? Good luck sleep training, hope its not as bad as you fear! I see my comment is in limbo and think maybe you are offended by the dependence question. I meant paci dependence. Just curious if the paci becomes more of an addiction after a certain point because I haven’t noticed it being a sleep crutch yet. You don’t have to publish my comments but I did want to clarify in case the wording in my first comment came off weird. I only comment on blogs I enjoy and wouldn’t intentionally be rude so my apologies if you felt that. Just hadn’t gotten to my computer to respond yet! I just mean it really calmed him down over the past 5 months. I wouldn’t trade 5 months of an unhappy baby for the need to sleep train. The night schedule is ROUGH! Saw these duke infant shoes on zulily today and thought of you! There are going to be people who object to sleep training. It was seriously the best thing we ever did. My daughter is not one who would even sleep in bed with us. That was play time to her. She would never sleep if she didn’t learn how to do it on her own in her crib. We also used Ferber and I wasn’t really looking forward to it, but the first night she cried 5 minutes. Night two was 2 minutes, and on night three she rolled over and went to sleep on her own with no crying at all. She’s almost 2 now and she’s really an awesome sleeper. She was probably as tiresome as Mazen when she was 4-months-old, but now she sleeps 12-13 hours at night. I can count the times on one hand that we’ve had to let her cry it out at all again after the initial times, and it was never for very long. There are some kids who get more worked up with CIO and it doesn’t seem to ever work for them, and I think if parents experienced that they wouldn’t understand how much CIO CAN work for other babies. Like Emily, both my brother and I were “Ferberized” as babies, and we don’t have any issues – well, not anymore than anyone else does! We come from a loving home, and I still to this day never doubt my parents will be there for me when I need them. In my work as a college academic advisor, however, I come across a lot of 18 year-olds who still can’t self-soothe! Seriously. They also can’t think critically, problem-solve, or make decisions without first consulting with their helicopter parents. I believe sleep training is a necessary part of human development. It is the first step in helping your child learn to take care of himself, which he will need to do one day. Contrary to what those so vehemently against it believe – who practice what they do more for their own comfort than for their child’s well-being – it is one of the most loving things a parent can do for their child. What size clothes is he wearing? My 7 month old loves the WubbaNub paci (with the small stuffed animal attached). It has helped her self sooth at night. I think the size helps her locate a paci and put it back in herself. She also “pets” her little lamb and rubs it’s ears when going to sleep. Sleep training is a life changer! Its tough but SO worth it. Good luck! In the top picture of M, what is the necklace he is teething on? Are they the specific chew beads? Do you find you like them? have you tried them while nursing (to fend off distraction)? They never get over the face-wipe,lol! 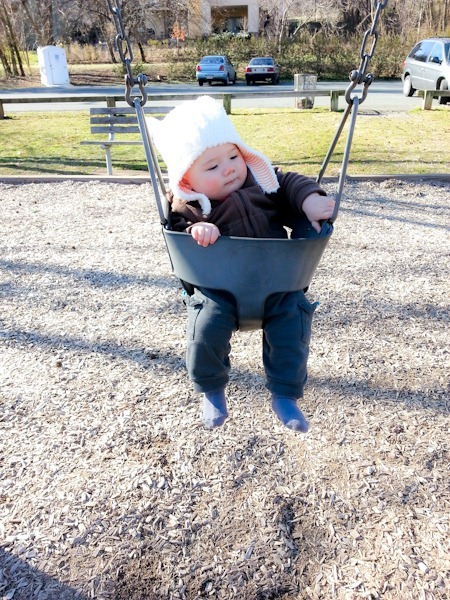 Btw, he’s such a cute chunker…my son was so tiny (actually still is-he’s 22 months and weighs about 27 pounds!). Isn’t it just exciting when they start eating solids?! I’m assuming you make most of it considering your healthy lifestyle?! Have you tried cutting back on his nap time to see if that affects his sleep intervals at night. Also keeping the house and baby a few degrees cooler during the day and a bit warmer and another layer at night can really help set them up for a better schedule, especially now that you are introducing food that might help him naturally sleep better and longer at night. Just a thought if you were hoping for a way to avoid the need to resort to crying it out. Not that you are, necessarily, just because you mentioned needing to brace for it, it sounded like something that you might rather avoid. Hi Kath! I love love love reading your updates on Maze. He is so precious. I have a little guy who is just about ten days older than Maze. We did a modified sleep training program about a month ago after my baby was waking throughout the night. Like you, I was absolutely dreading it and it was a pretty tough few days. We used to the sleep easy solution which I felt spoke to me emotionally and developmentally. While I still do get up to nurse my baby once a night, this program definitely helped with teaching him how to fall asleep on his own and put himself back to sleep through the night when he was not hungry (it seemed like he was waking through the night and I was feeding him automatically when maybe he just needed to be soothed back to sleep.). It helped so much with naps too! I know can put him in the crib awake and he puts himself to sleep by himself (I never ever thought I would be able to do that!). Best of luck! Hello, Mazen is so precious. I absolutely love a chunky baby! When my girls were babies I would knead their thighs like dough… love those chunky legs with the rolls. Too bad that’s not as cute when we are adults. Would love a shot of Mazen’s legs someday. Also love the first pic of him and Matt on Kerf, awesome kissable cheeks! When we (really me!) sleep trained the oldest one, I could hardly stand the crying and my milk would always let down…geesh it was tough – I lasted one day. My mom encouraged me to keep trying and suggested that I take my shower during that time, so my body/mind couldn’t react. 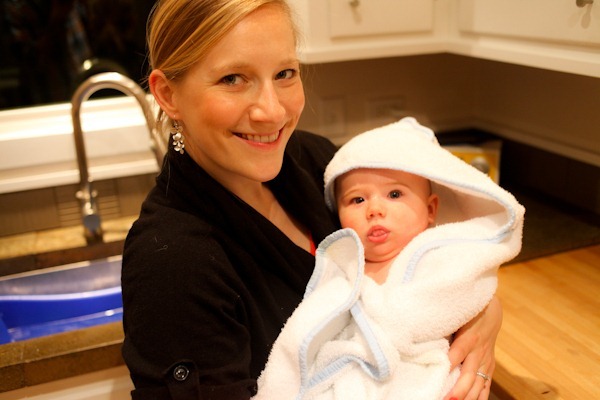 So I bacially stood in the shower at first nap time, afternoon nap and evenings and let the water cover the crying….I was really clean and he learned very quickly…and it was a successful after just a day or two. Whatever way you need to get through it, just do it… by the way, my kid is a teenager now…no trust, attachment or idependence issues yet! I wish you so much luck with the Ferber method. I know how incredibly hard these 6 months have been for you AND Mazen. You will both feel so much better once he’s sleeping well at night and you’ll really notice a difference in how happy he is. You’re doing such a great job! Mazen is just so cute! I love the picture of him on the laundry. As for the sleep training (because everyone’s got an opinion, right? lol) if you are really dreading the Feberizing technique, there are many other effective methods that do not involve ANY CIO at all. Have you read the No Cry Sleep Solution or The Baby Whisper? Both have good, workable techniques to help Mazen sleep for longer stretches that don’t involve leaving your baby alone to cry, and you wouldn’t dread or feel bad/guilty about it. If you’re dreading something, you should listen to yourself – intuitive parenting, like intuitive eating! Do what feels right for you and Mazen – good parenting decisions shouldn’t make you feel bad. My girl was also up 5-7 times a night at Mazen’s age and it was rough since I work 40+ hours out of the house, and I used some of those techniques and her sleep greatly improved. Now at 14 months she sleeps 11-12 hours at night with only one wake-up around 3 am to nurse, which I am super happy with (and I don’t feel sleep deprived at all!). You should do what feels right for you and Mazen, not just what is popular and trendy in parenting! Been away with my own child from your blog these past 2yrs (they grow so fast!) and so happy to see you guys have a baby!!! Kudos to you for fitting in all this healthy food and exercise still as a mom. I find time just runs out on its own since Arielle was born! Sleep training – cause i can’t resist. I COMPLETELY agree with Grace (above comment). While I am against CIO as well, it is not for me to judge, and i KNOW that it works very well on a LOT of babies. I also believe it probably DOESN’T cause any problems with the child, however, it DOES with some MOMS!!! LOL! I tried it once with Arielle when she was 9 months old ( i just grinned and beared the sleepless nights before then) and she made herself PUKE she was so traumatized. I never felt so guilty in my entire life. After that I tried the other methods and found that they worked so that to this day, my daughter who is 2 and a half has NEVER cried it out! If there is ONE suggestion I can make is this. Try it. If you don’t like it, DON’T continue. There ARE other ways!!! If you and Mazen are comfortable doing it then NO ONE should judge! Mom’s have a gut feeling about their child and that gut feeling is always right. Don’t choose based on trends, family, friends or even logic and science. Choose based on your raw animal mommy insticts! Right around 7 months is when my daughter learned how to put the paci in her own mouth. It didn’t completely solve the sleep problems, but the wake ups were definitely lessened. Hopefully M learns to grab it and put it back in his own mouth soon! We had 4 different exersaucers (thanks to friends) including the GoPod, but this one was by far his favorite – I just loaned it to a friend, otherwise I would ship it to you! Also, I loved this bowl and “smasher” – baby Cord did not care much for baby food, so at about six months I found this, and we began smashing avocados and anything else smashable, and it was a huge hit as well. He love every combination we came up with using that bowl, and is an amazing eater – many thanks to ideas I gleaned from your other blog. I am a speech therapist who often works with feeding issues with kids, and I’ve become a much better feeding therapist from reading your blog – you rock! So excited to hear about how the solid feeding goes for you guys, it was so much fun for us! RE: sleeping/sleep-training. I’ve commented on here a few times about what a champion non-sleeper my girl has been, so I thought I might share an update just in case it’s useful to anybody. Fair warning, this may be too long to print/read. The first day we talked about it during the day, how mommy and daddy needed better sleep so that we could be more fun and play more during the day, etc. and how tonight she was going to sleep all night in her crib. Bedtime was normal, and she woke around 11:30. My husband went in and soothed her until she stopped crying, then told her it was still nighttime and she needed to go back to sleep. Then he left the room (at which point she started crying, not all-out sobbing, but light frustrated crying). We waited 5 agonizing minutes, and then he went back in and repeated. 5 more agonizing minutes of intermittent crying and “mom-mom-me” (heart-breaking). Then he repeated a third time. She cried for 2.5 minutes and then went quiet, and subsequently went to sleep. She woke 2 other times later on that night and I went in, told her it was nighttime and she needed to go back to sleep and I would see her in the morning. She plopped back down in her bed and stayed quiet as I left the room. Each time we went in we patted and snuggled and soothed her as much as it took for her to quiet down, but without lifting her out of bed. And when we first left her to cry while waiting out the 5-minutes, she wasn’t wailing, I would have gone in sooner for that. It was somewhat forced crying, the type she usually uses to let me know she’s unhappy with a decision I’ve made. Other details: she does still use a paci only for sleeping, and she is currently teethign with her FINAL (hurray!) molars. The next few nights she woke maybe once, and after we went in and spoke to her she went right back to sleep. We’ve been a week now of not having her wake us at all most nights. I am finally starting to actually sleep for longer stretches of the night, but it’s taken me a little while to get back into the habit of sleeping and also to get over tormenting myself about how she cried herself to sleep. So the verdict? My husband thinks it’s a huge success. He couldn’t be happier and is amazed at how easy it was. I am also amazed at how quickly she’s adjusted to the new bedtime “rules” and how (relatively) little crying it took us to get there. But I’m not ready to call it a success. For one, I’ll wait another week or so and see how well it sticks. But for two, I’m still unsure about whether it was “right” for me. One of the things that’s very important to my personal philosophy of mothering is that my kids feel heard and respected within our family. This doesn’t mean she’ll always get her way, but that I’ll try to remember to at least hear and acknowledge her argument/view/feelings even when she’s so young that her feelings can only be expressed as a cry (when she’s was littler) or as a declaration of “MAD!” (now that she’s getting older). I’m not a helicopter type mom — I let her play in the mud and get bumps and bruises all in the name of growing up and figuring out her body and her world. But I worry that by letting her do some crying alone that first night I was refusing to listen to her very real desire to be cuddled in my bed, and that I was communicating to her that I don’t care about her needs at sleep time, that she got the message she just needs to shut up and stay in bed. She’s a very sensitive and thoughtful child, and I worry that she’s possibly taken this message to heart, because she now makes not a peep even in the morning even when the sun is shining in and it’s time to get up. She’s also become more attached to a few special blankies and teddies since we made the change, and although I know this is developmentally normal, I do wonder if it’s related to a feeling of needing to find more security in inanimate objects now that om is less available during sleep. So, in the end I’m unsure whether I would do it again. I know I would not have felt okay about doing it before she was old enough to have it explained to her. But at this point, I guess I’m hoping that it will work out that we can all continue to get better sleep (and I dearly hope that she’s actually sleeping in there and not just lying in her bed with a bellyache all night not daring to make a peep), and that over the next few weeks and months we can work on making sure she understands that’s it’s okay to wake mommy and daddy at night if you need something, if you’re awake for the day, if you don’t feel good, or if you had a bad dream and need a little cuddle before going back to sleep. If we can accomplish that, I may dare call this new sleep system a good thing for our family. Best of luck to you, Kath, in your path to (hopefully, eventually) better sleep. I tend to think that as long as each of us, as mothers, make decisions for our little ones based on our core beliefs about the mother each of us wants to be (different for all of us, of course), then we never decide wrong. I find myself checking in like 5 times a day. I CAN’T WAIT for your baby food post. I don’t mean to rush you, I’m just so excited for it since we started food too!!! I can’t believe Mazen is almost six months…and Reed is almost three months! Loving the finger nail glitz in your last photo! Also, we Ferbered three kids and they all grew up to be healthy, happy, and wonderful people. The other LOVED her paci! We clipped it to her pjs with a short ribbon so she could find it herself at night… How great it was when she figured out how to get it herself! As they got to age 2 1/2 or so we started talking about giving up her paci. She loved our neighbor’s birdbath and feeders, watching all the birds, so we started talking about how the mommy birds would really appreciate having a paci for their baby birds. She went for it, and before she was 3 walked over one day and left her paci on the birdbath for the baby birds. She asked for it back once or twice and then that was that. We let it become her choice to give it up. 2 quesitons-I love your pictures, and not sure if you’ve posted about your camera(s) before, but was wondering what type of camera you had. I have a 6 month old daughter Maeve (born 9.10.12!) and have loved following along during your pregnancy and adventures in motherhood since our kids are so close in age. The pic’s are amazing…just wondering where I can get my hads on a good camera that is not insanely bulky to carry with an infant in tow. Also, any tips for solid foods? In your pictures, Mazen seems to be opening wide for his spoonfuls and can’t get enough! Maeve just kind of makes an icky face and doesn’t seem to enjoy them (we’ve tried avacado, pears and apples) very much. I know it may just be a case of her not being ready, but to keep trying. We use the munchkin spoons so I don’t know if that could be why. 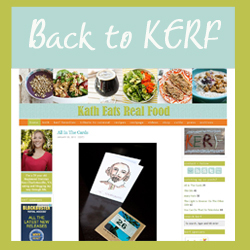 Here’s a link to my photography post on KERF. I use the Mark II but I would recommend the T series if you’re new to DSLRs. However it’s on the bulky side! Any of the Canon Powershots would be good small point and shoots to carry around, but I just use my phone most of the time! Babies in institutions, like orphanages, cry A LOT less than babies raised in homes. They learn that crying is useless. No one comes to help you when you cry. Personally, I find that incredibly sad and can only imagine that sleep training is teaching a baby the same thing. Crying is useless. Mommy doesn’t come when I cry.